40s fashion is closely connected with its history. It is diverse, practical, changeable, even simple and even elegant. In the following article, I will show you beautiful looks of the early’ 40s, as you can find such pieces and even today. The English secret service officer Max Vatan (Brad Pitt) and the French Résistance fighter Marianne Beauséjour (Marion Cotillard) learn to know and love in the secret order of the allied powers in Casablanca. Their intimate relationship is put to a severe test when Marianne is suspected, to spy for the enemy. Allied – familiar strangers by Paramount Pictures plays in the early 40s, from the warm desert and the elegant Cafés Casablanca and the cool, rainy England and London city. Can a film, shot with so much attention to detail, authenticity of scenes and fashion, that the audience feels as he would peek in a part of the European past. I have one of my favorite outfits of Marianne implemented in this picture, a bright, summery ensemble. While I’m wearing the seamstress of Bloomsbury, the image made FEVER Sophia Molek Photography. In this second part of my contribution to Allied – familiar strangers I would like friends so my favorite looks of the stylish Frenchwoman Marianne present and they interpret my own way. Always in sight, with what backgrounds fashion was created at that time. Still, you can learn how can you still find such beautiful looks and wear, because there are some great brands that specialize in the 40s fashion. The first half of the 40s was marked by shortages in materials and little change in fashion trends. The purchase of clothing and materials was not only the economy in gear. For women, fashion was a distraction from the hardships of everyday life. The psychological benefit of clothes was therefore very closely connected with their meaning. This is to emphasize that those who lived in abject poverty, of course not dealt with fashionable trends. The fashion of the 40s was a mode of realism, practicality and versatility. Costume designer Joanna Johnston formed the characters of Max and Marianne in a very glamorous way. The film begins with summer, sand colored, high-quality clothing in Casablanca. In the course of history, the viewer sees a mixture of Marianne’s Bohemian of fashion influenced on and Max’ formal clothing in London. According to producer Steve Starkey Joanna Johnston worked continuously, authentic work out every detail of the era. Starkey pointed out that the costume design of the key for the style of the movie had been. For the French designer Joanna designed a classic, glamorous appearance. Her fashion is cultured, elegant, stylish, which is characterized by high-quality materials and attention to detail. Paris is still the epicenter, always the fashion world was in the 40s. Styles that have been created by Couturiers, wore the ladies worldwide – whether now as originals, or on the other hand more often than interpretations, such as by larger department stores were offered. Luxury was still current in terms of evening wear, it was combined with practical elements. All particularly important: long sleeve. The example of this dress, you’re wonderful, that was designed evening wear at that time also for expediency. In the event of a bombing raid, the women for the cold nights in safe shelter were better protected. In France, knitwear and Jersey dresses with hoods in many collections were to see all this mixed with a dash of patriotism. The propaganda reminded French ladies are still in shell. This should demonstrate that they are not so easy to defeat. Characteristic for the 40s, narrow waist, more hips and drap Pierhave been fashion. Square shoulders, a closely cut or stressed belted waist and a general maskulinere stature showed the dominant silhouette of the 40s. To interpret such a look is beautifully simple. 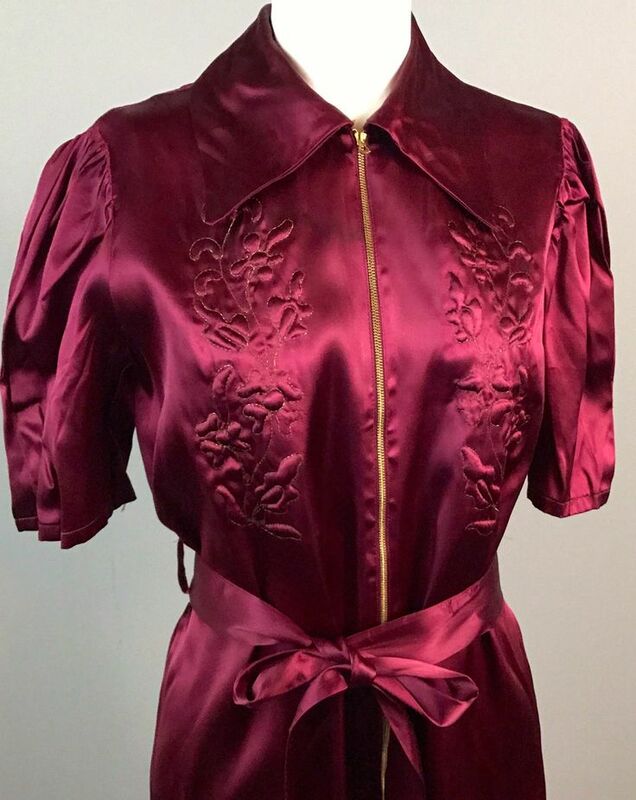 Here’s an example chosen by me, where I beautiful pieces of the London label The Seamstress of Bloosmbury wear. Because I could find no similar dress, I have interpreted the outfit by Marianne with an elegant blouse and a swing skirt. The blouse has a folded collar and big buttons, such as the upper part of Marianne’s dress. Because the British label on fashion of the 40’s focuses, you can be sure to find authentic pieces of high-quality materials. Many of these swing skirts can be combined with a belt, which you can further emphasize the Hourglass silhouette. Due to the low availability of fabrics and dye, there was only limited colors and patterns for clothes. Grey, blue, green and brown tones dominated the palette of fashion. To find something serious there but also off and on lighter tones, floral or striped patterns. In America and France, the patriotic colors of blue, red and white were quite popular to expressing love for the country on the one hand, on the other hand, to demonstrate resistance to the German troops. Due to lack of materials, fashion was modeled pretty closely to the body. So he lay the hem has been shifted upwards, in street clothes just below the knee. Shorter skirts were also practical for the ladies. Because there was a shortage of fuel, they often took the wheel. The most important fashion innovation pants for ladies. Women’s pants were designed by the fashion designers Chanel and Patou in the 30s, but only in their early 40s, they included foot in the everyday clothing. Trousers were part of work clothes in factories, and now they were taken over by young women, because they appreciated their practicality and convenience. Another advantage of the new pants: she covered the legs! Stockings and rayon also succumbed to the shortage, so the women were grateful for this alternative. As you can see in the pictures, the combination of blouse and pants is a Wonderful everyday look. The emphasis in the new bottoms factories on the waist, here highly tailored was as also in clothes. Buttons were typical of trousers at the time. You can find the great ensemble at Vivien of Holloway in all patterns and colors. I can have friends in search of the London label after beautiful, vintage-inspired trousers to the heart. The outfit can be completed with leather gloves or a beret. The look, for example, a curly hairstyle fits as she wears also Marianne. For I shot up the curls overnight, what you can take classic pin curls, or – how I use it – sleep winder. In the morning I combed out the curls not as usual but they just connected in a loose braid . This style requires also Not elaborate make up. In everyday life, women in their 40s were rather simple styling, lipsticks were saved mostly for special events or the evening. In times of austerity and rationing, Accessories were a popular solution to the own individuality to emphasize, to revalue outfits and modern fashion. In contrast to the clothing, hats were expansive and conspicuous. It seems, this was an attempt, the horrors of the world to escape. Shoes were quite expensive and not easy to get. Because leather was very rare, you tried to take – reptile skins, plastic materials, jute, cellophane, bast, and even straw every imaginable material as a replacement. Alternatives for the soles were Cork and wood, where they seemed not very comfortable to run in quickly. So the paragraphs become shorter, are practical and robust. The Most popular shoe styles were the more compact Mary of Jane’s (at that time a name for flat, rounded shoes with braces), flat Oxford lace-ups (worn with white stockings), wedge heels with cork or wooden heel and peep toes, which are found mostly in the American fashion of the 40s. For my interpretation of Marianne’s blue dress I chose a model of Miss Candyfloss, because this label for beautiful swing dresses with shirred detail is known. A lady can go truly wrong with such a piece! To create an individual look, I’ve combined it with a vintage leaf brooch and an original ladies Hat. In addition, you can wear such a dress, for example, with Brown stockings or a scarf. Such an outfit can both rather loosely, as are also elegantly styled for an evening event. Men’s fashion has changed little at the time. Usually the men wore nothing more than what their fathers available had. The basic equipment consisted of a three-piece suit, a shirt, tie and hat. The suit was the hub of men’s fashion. Off and on, depending on how wealthy men who a new suit could be – bought either second hand, out of the box, or, if you could afford it custom made. Most men had only one or two suits available, which they had to wear on all occasions. So this usually conservative colors were modeled. Dark blue, gray, Brown and black, sometimes pinstriped, were the most popular colors. Wool was often used as a material. In the 40s years fashion cut pants quite spacious and closed like when the ladies with buttons. Casual bottoms were used in the summer or during sports. They had the same style like suit pants, often in white or grey, from worsted or Tweed. Ties the splash of color in an otherwise more conservative outfits were common. These were much shorter than the today’s pieces often because they were worn with West or cardigans. So they had to reach only about under the breast. Ultimately is fashion – then as now – a question of individuality. The 40s fashion is inseparably connected with the second world war and its consequences. The history of this fashion is therefore a history of war and peace, by continuity, thrift, and luxury. The outfits shown here are only a small insight into the clothing of the time. She was heavily depending on the personal, financial and political circumstances of men and women. I find it very touching that fashion was a source of hope in dark times, a help, the gray everyday life to escape. Also it was adapted more and more the needs of women, in contrast to the floor-length dresses and corsets that were common a few decades ago. In spite of the steps in the dark, this fashion was a small step toward more self-determination of woman. 40s fashion is a fashion that we should see in the context of its history. And a fashion, which is one of the most beautiful, classic and courageous for me to this day.